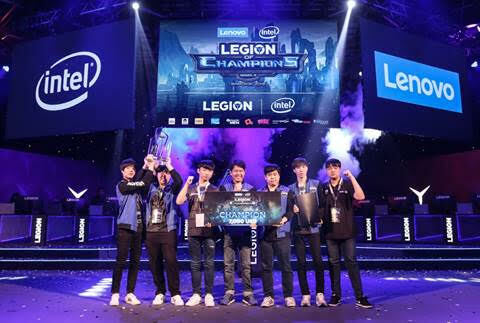 SINGAPORE – January 28, 2019 – Lenovo (HKSE: 992) (ADR: LNVGY), the world’s leading PC and smart device manufacturer, today saw its Legion of Champions Series III (LoC III) Grand Finals come to the end of its journey in a spectacular fashion, with team Awe Star from Korea, lifting the championship trophy in triumph as part of their first LoC tournament win. The annual eSports tournament, held in conjunction with Intel, pulled in an impressive crowd, bearing witness to the intense competition that unfolded over the last three days. “Team Singapore has made us proud by showing up so strong at LoC this year. Given the rise of eSports in Singapore, we are excited to be a part of today’s vibrant gaming culture. This is our third time participating in LoC and we can’t wait to see even more exciting developments in the eSports space next year,” said Eddie Ang, Singapore Country General Manager. Celebrities such as Stamp Apiwat and Sweat16! and cosplayers graced LoC with their presence to get everyone moving their feet!